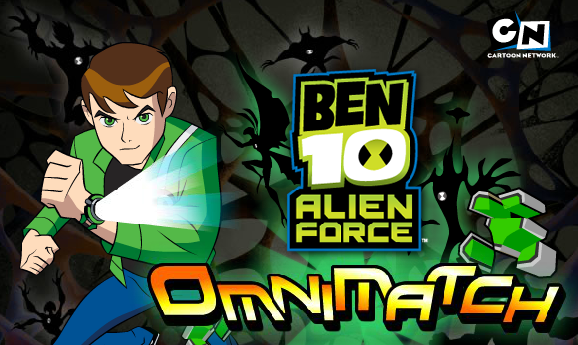 We are back with new exciting ben 10 game for all the fans out there – Ben 10 Alien Force Omnimatch. It is a very different alien force game where you do not need the ultimate power but a sharp brain to win the game. Get ready for some mental exercise and match maximum alien force aliens in the amazing Ben 10 Alien Force Omnimatch game now! This game is based on a typical block matching games that are quite popular now-a-days. Ben 10 Alien Force Omnimatch is a puzzle game where you need to match the similar piece three in a row. Yeah! that sounds quite easy but when you start playing the game, the difficulty will increase at each level. So, before you start playing, let’s get a closer look in the gameplay! As the game begins, You will see faces of different Alien force aliens in a grid form. These will include faces of Humunguosaur, Swampfire, Jetray etc. The grid will have eight rows and eight columns. You have to carefully look at the square pieces marked with alien faces and move them around to match three similar alien faces in a row or a column. If you succeed to make such a triplet, those three squares will disappear. To move a particular square piece, just move the cursor on it and hit space bar. After that use the arrow key to move the selected square in any of the four directions to create a triplet. Remember, this is a time based game and you have to complete each level in the given time only. So you better be fast! Pro Tip: Try making multiple triplets at a time to earn extra points and complete levels faster. That’s not all. There is a mini bonus game which runs alongside the main game. As soon as you make a triplet in the main game. The face of the alien whose triplet is made appears in the mini game. If you’re intelligent enough, you can make a triplet in the mini-game too to earn bonus points! So, are you ready for the new Ben 10 Alien Force Omnimatch? It’s to see your skills mate! Don’t Forget to give your rating for Ben 10 Alien Force Omnimatch game and share your tips and tricks to win this game in the comments section below.